The MKE 400 features switchable sensitivity for optimum results when capturing long and short distances. Box Dimensions (LxWxH) 9.4 x 6.7 x 1.6"
MKE 400 Compact Video Camera Shotgun Microphone is rated 4.3 out of 5 by 215. Rated 4 out of 5 by Travis from Great little mic I first used this guy back in '09 or '10 in Africa. Low-Profile. Audio was great! I was using the 5d Mark II then. I had it mounted to the side of an On-Camera light with a mount that had a Cold-Shoe. I did a lot of candid interviews, and so a lot of times I simply pulled it off my camera and had someone hold the mic closer. I don't know if the cable was longer then, but it performed wonderfully! Unfortunately, the shock mount broke early on(probably my own fault...see pic), but made it useable again with some Gaff Tape. Would be nice to be able to replace those. That one was a rental. I've used other since, including the ones by Rode. I have found this to be my personal favorite. Rated 5 out of 5 by Raymond T. from A fan Others have reviewed the sound of this mic as thin. If the low cut switch is on (left most position, it is. If it's switched to the middle position, I am surprised at how good the tiny little speck of a mic really sounds. I use it for DSLR run and gun video. Mount to camera shoe, switch to middle power-on position and plug into the camera's mic input. Done. Fits ANYWHERE! Pocket, camera bag -- wherever. Try THAT with an ME66/K6! Being small means you can't be rough with it, but you should be gentle to all audio instruments anyway. Bargain price. Tiny size. A must have for traveling light. All without too much compromise in sound quality. Rated 3 out of 5 by Luis from Okay sound but flimsy construction I bought this mic about a year ago and my first impression was that it was a great improvement from the internal mic on my 5D MKII. I use my 5D to mostly shoot weddings and what I can tell you is that this mic is not made for run and gun type of shoots. After using it on about 4 or 5 weddings a small piece of plastic broke off that helps keep the rubber shock absorbers in place, leaving the mic flopping about a little. I managed to order a new part from Sennheizer but since then I've had situations where I don't get any audio at all or intermitten audio with static. I'm not sure what's broken on it now but it's defintely not made to last. Rated 5 out of 5 by Daniel from Terriffic mic! Works very well I've read a lot of negative comments on this mic concerning noise, and I had those problems too....at first. Then I realized this was an active mic. For it to work well with your DSLR or video camera you have to turn the mic level on the camera all most all the way down. On my Canon M3, I turn the mic level all the way down then turn it up one notch. You'll get stellar results. Some video mics are not active (they don't require batteries and do not have an on board pre amp) like the Rode Video Micro. Those will sound fairly good as a plug and play mic without any adjustments, but the MKE 400 is superior once you learn how to use it with your camera. You'll never hear HISS again, just good clean audio. 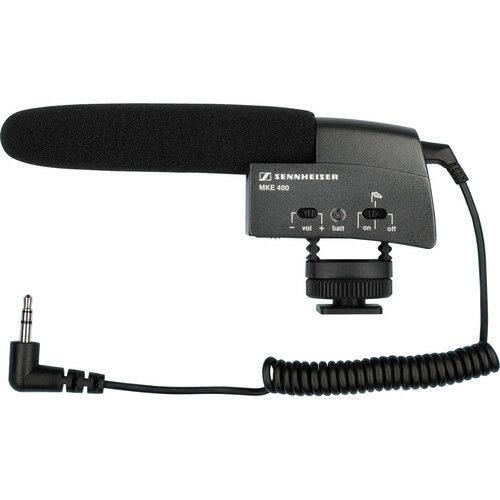 Rated 5 out of 5 by Michael from Small and Powerful I use this to capture audio for professional video, both directly to Canon DSLRs and to an external Tascam field recorder. It is fantastic! Really small and light, which makes it both easy to carry and unimposing in documentary/interview shooting. Took under an hour of playing to figure out the different settings that can be toggled on the mic. I also use a Rode videomic, and prefer the Sennheiser's sound quality immensely: relative to the Rode (and in general, especially for the price), the audio this guy captures is crisp, noise is pretty negligible, and the range is impressive. No complaints. Rated 5 out of 5 by Jim Costa Films from Excellent Mic Even though this mic has been around for many years, I purchased it because the frequency response is fantastic. I use it to shoot outdoors and in conjunction with the MW400 wind muffler, it cuts down the low frequency rumble of wind noise. The mic is easy to use and the directionality of the pickup pattern is fairly tight; somewhere between cardioid and ultra cardioid which is amazing considering the size of the unit. It is small enough that even with the muffler, it won't hang in front of the lens as longer mics do. It costs a bit more than a Rode mic, but is well worth the few extra bucks. Rated 4 out of 5 by Karn from Great Mic, Bad Foam Cover I purchased 15 of these mics for the Digital Film Production class I teach at a High School.? I love the easiness of use and the durability of the mic. If I have one complaint, and unfortunately I do, it is that the foam sleeve that covers the mic comes off very easily.? I have lost 4 of them in the first year.? The fact that the replacement costs almost 7 bucks is a bit crazy as well.? I have a set of RODE VideoMic Pro Plus that I don't like as well as they are made of plastic.? However, I have used the heck out of them and never loose the foam cover.? Slight design flaw there Sennheiser. Rated 4 out of 5 by Anonymous from Compact, Light, Affordable and Good Audi Awesome! We have two of these, using them on the 5D MKII shooting video. Light, small footprint. The only reason I didn't give it 5 stars is because the mount is a little weak. I barely brushed over the mic while it was mounted and the rubber piece snapped. Although Sennheiser replaced the mount free of charge with no issues, I think it's a design issue they should look at. Also, an on/off indicator would be nice. A couple of times I forgot to turn it on and even though that's my fault, an indicator probably would have helped me. Overall though, pretty good sound and a great value. We only use them for reference audio and run and gun audio but much, much better that the on board cam audio. Can the mic be removed from the mount to use as basically a handheld? To be honest I havent tried it . If it is still connected I dont see why it cannot be removed from the mount. Does it work with Canon 6d? Sure will - plug and play! Can this microphone be attached to an iPhone 8? Not without this adapter B&amp;H # ROSC4. That is a TRS stereo connector. For a phone it has to have a TRRS connector. That connector will make it possible. Can I use this mic with sonyCan I use this mic for Sony a6000? Would this work for a Canon VIXIA with a mini advanced hot shoe? Does it work with canon 60d? Would this mic work with a Sony A65? Will this work with my go pro hero4 silver ?